We are here to help you find answers. 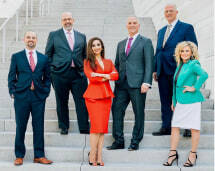 Our lawyers have been recognized for their ability to obtain favorable case results and for their commitment to individualized service. Criminal law attorney Noah Weisberg and family law attorney Amy Weisberg have been selected for inclusion in Virginia Super Lawyers — Rising Stars 2014 and 2015. Contact Weisberg & Weisberg, PLLC, for advice regarding your criminal law matter, family law concern or personal injury matter. Our lawyers will take the time to listen to the details, explain what the law says about your case and give you honest feedback about what you can do next. Our lawyers are knowledgeable, experienced and compassionate. I had a complex defamation case against an individual who was posting false information about me on social media. I retained the services of Weisberg & Weisberg and took my case to trial. I won my suit and was awarded a substantial judgement. I couldn't have asked for better representation!